What will Google think about my website changes? Is StoryBrand ok for SEO? Could I lose traffic by "StoryBranding" by site? Mess this up and you could lose a ton of traffic. 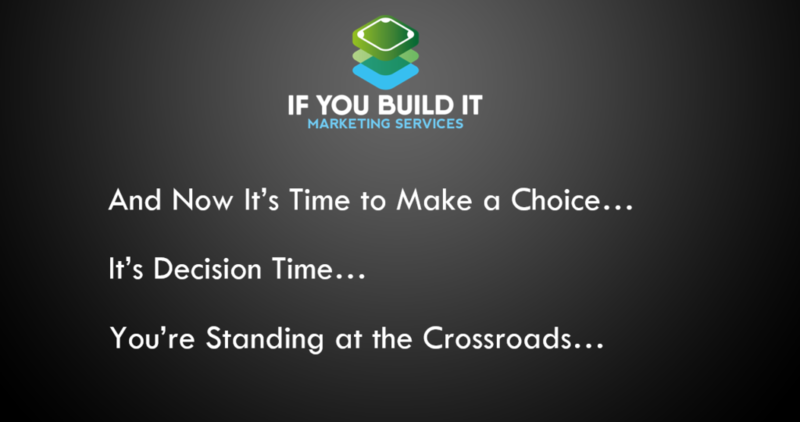 The good news is you CAN clarify your message while maintaining good SEO. In fact, I've done it. 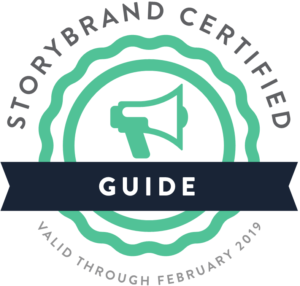 As a Certified StoryBrand Guide, and someone who has built multiple websites on the back of SEO and Google search, I feel I'm uniquely positioned to help you with this topic. 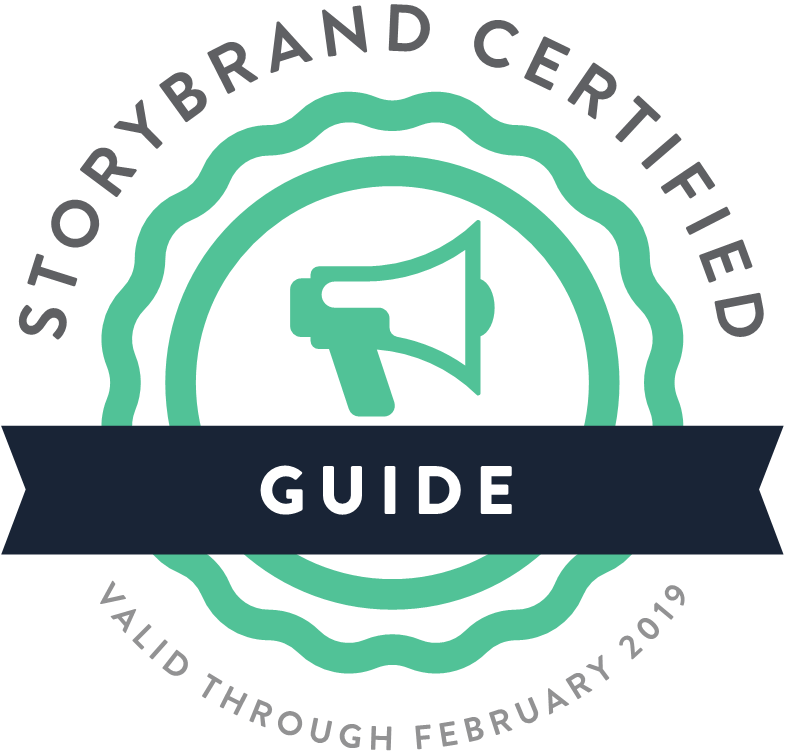 So if you're a business owner, marketer, or even a StoryBrand guide looking to implement StoryBrand into a site, follow these Do's and Don'ts to stay in the good graces of Google and increase your traffic. Let's begin with a few clarifications. 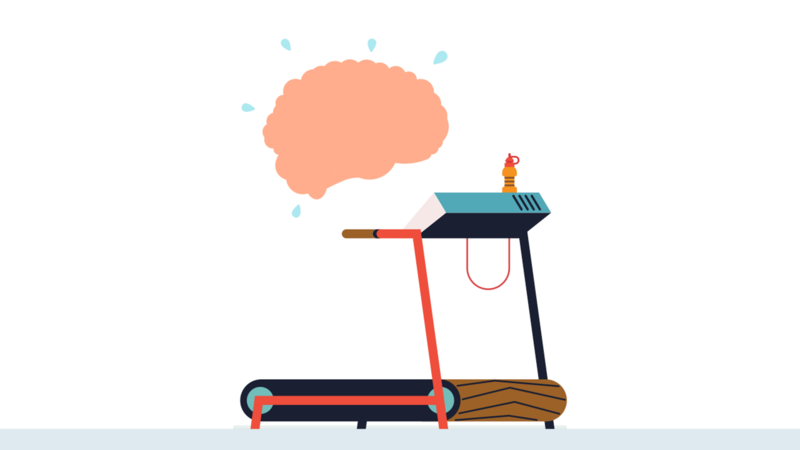 When a visitor lands on your site, you should picture them getting on a treadmill. The more confusing you are, the less likely they'll continue to pay attention. how is going to make my life better? and how do I buy it? ... or they're likely to hit the back button. "Is this wrong? Should I tear these pages down and start from scratch?" If you have blog posts getting traffic, perhaps you're asking the same questions. If you've seen a keynote by Don, you'll know he even pokes fun at sites with too much text on them. He actually takes quite a funny jab at Jeb Bush's website when he was trying to get the Republican presidential nominee. One of the things he points out are the two paragraphs to the left here. "Now look at these two paragraphs here. Who wants to read that? NO ONE has ever read these two paragraphs in history. I've given this keynote 5 times and still haven't read them. 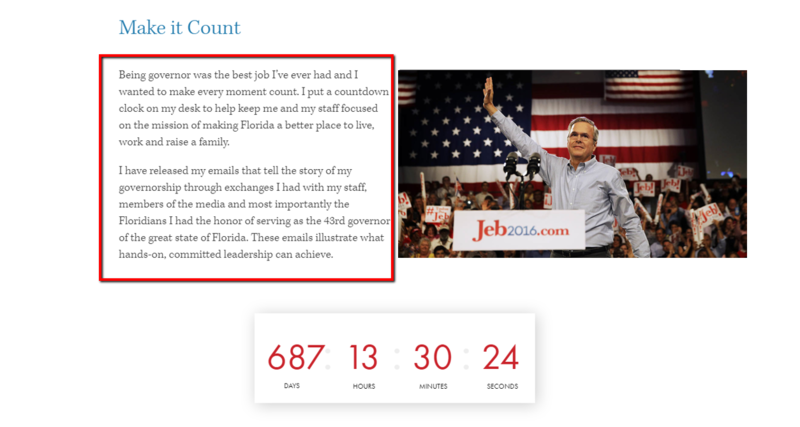 Jeb's wife told him she read them, but she lied to him." But how would I do that to my website if 99% of my top ranking pages were to blog pages comprised mostly of text? 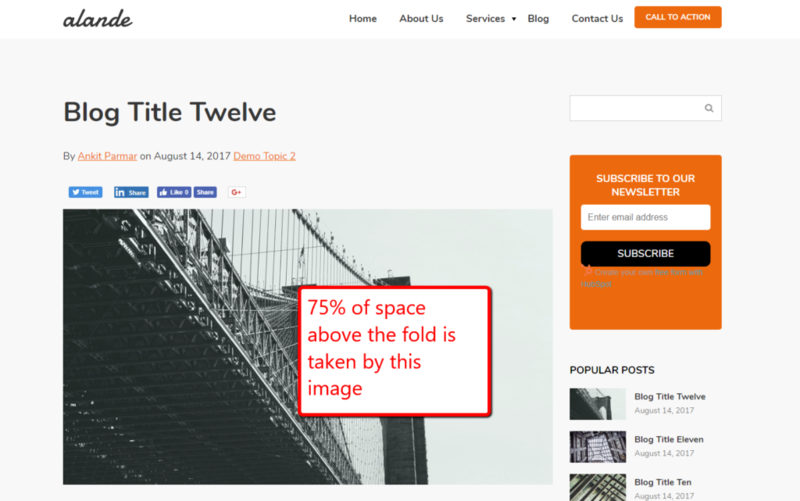 After a bit of thought, I realized that I couldn't possibly remove 90% of the text or add a slick header or image to my blog posts. In fact, if I did, it would be detrimental. The fact is, the in-depth, lengthy content on my site was probably the #1 reason I was getting so much search traffic in the first place. 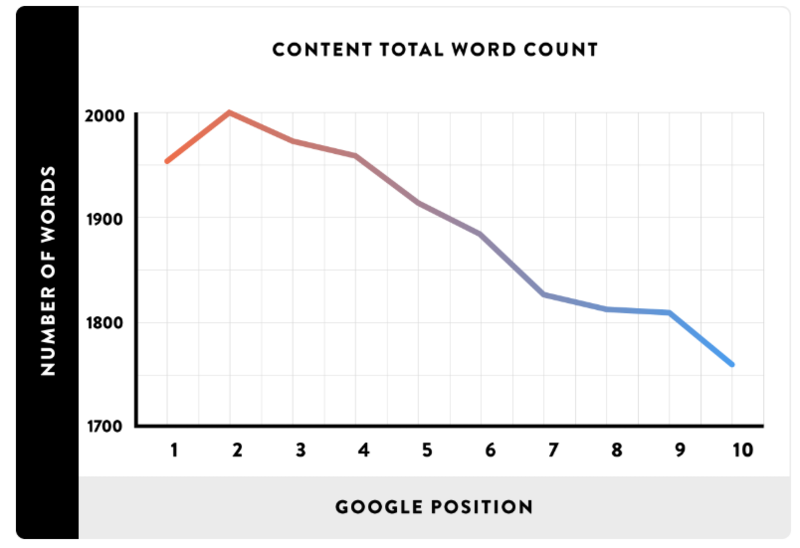 According to Backlinko, who analyzed over 1 million search results, the average word count of an article ranking in position #1 in Google is now 1890 words. So we actually NEED long-form content to rank. 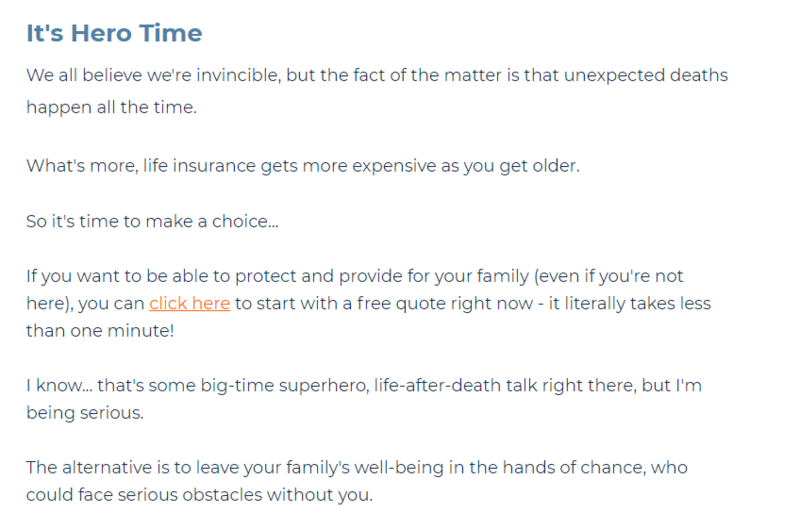 After all, even StoryBrand has a blog, and guess what... its articles are filled with text too! What about Adding a Home-Page-Like Image? 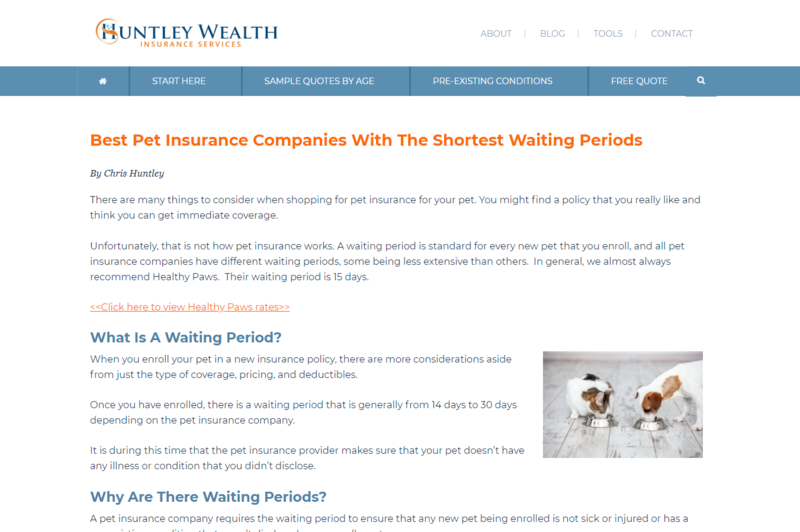 You might think, "Ok, I get not deleting my text, but what if I added a giant, nicely designed full-width image or header to my blog posts to greet my visitors similar to a homepage?" Well, that would also be a mistake. Multiple websites have reported that Google favors ranking pages whose text starts higher up on the page "above the fold." In other words, we want our content to appear right when a visitor loads our page without having to scroll down. That's the part of your page that's "above the fold." 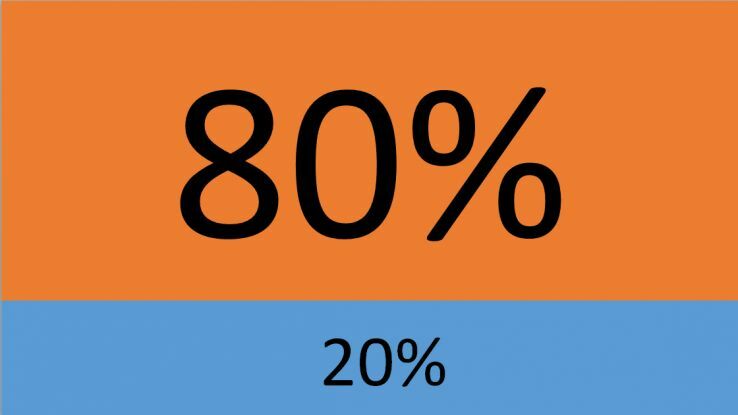 Besides the SEO benefits, content placed above the fold also grabs an estimated 80% of our visitors' attention, according to Moz. So we need to use your area above the fold wisely. I like to make sure my headline and introduction are both visible above the fold, so if I use an image at all, I make sure it's small or I add it after a couple paragraphs. So I came up with a different plan. Here's how I "StoryBranded" my articles without removing text or making major design changes. Like I said, if you want to rank in Google, you usually don't want to be deleting your content. If anything, you want to add more. By going through my content and making sure I had hit all 7 points of the StoryBrand framework, I ended up adding images, more video, and even MORE text to all of them. ... all things Google absolutely LOVES! This was the perfect way for me to talk about what success would look like if they bought from me, and what failure would look like if they did nothing or used a competitor. Here's an example below where I described the success bucket and failure bucket, and forced my readers to "make a choice" between the two. Note that by editing my conclusions, I was ADDING text, which is GOOD for SEO. Helping your visitors "conserve calories" does NOT mean you have to delete content, especially on blog posts. 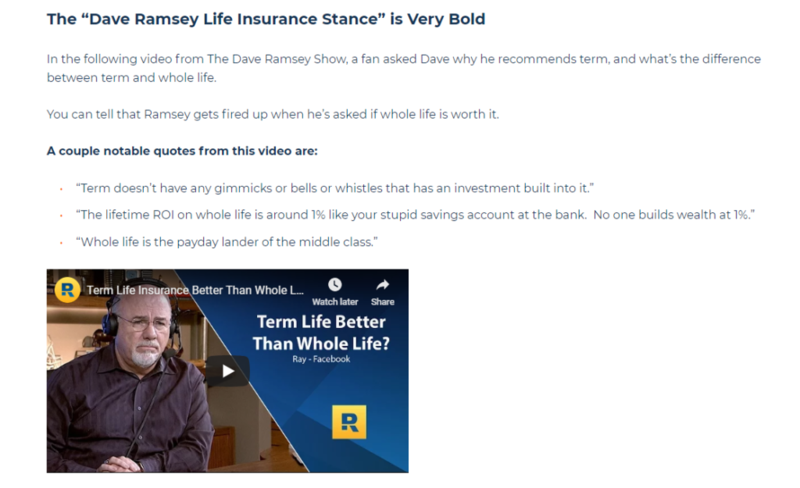 As an example, on an article where I discussed the different types of life insurance, I embedded multiple videos by Dave Ramsey on why he dislikes a particular type of insurance. ... it wasn't even my video. I grabbed it from Youtube, but I added it anyway. 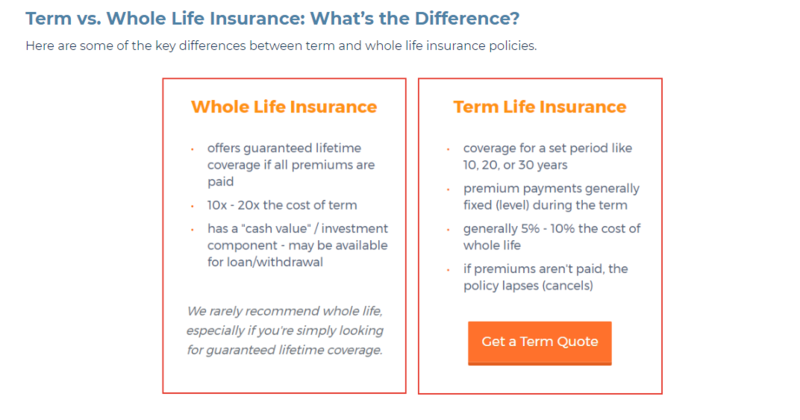 It helps break up the text, keep people on the page longer, add a different perspective than my own... so many benefits. You can read about ​more elements I added to my site by clicking here. Now when we're talking about redesigning a home page or sales page, which typically has less text on it than a blog post, our ability to delete text is much easier. You can add or change images, add whole sections, remove whole sections... and can usually make pretty radical changes with little-to-no traffic impact. #1 and #2 - Are we getting traffic and what words are we ranking for? I recommend you use a tool like ahrefs.com to search your traffic and what your specific page is ranking for. Be sure to grab the EXACT URL of the page you are considering changing, and set ahrefs to only yield results for that exact page. Example of Safer Site to "StoryBrand"
Say you were the owner of Remax.com and wanted to "StoryBrand" your homepage. An ahrefs search shows the homepage is getting about 204K organic visits per month. That's definitely nothing to sneeze at, so we'll need to proceed with extreme caution. 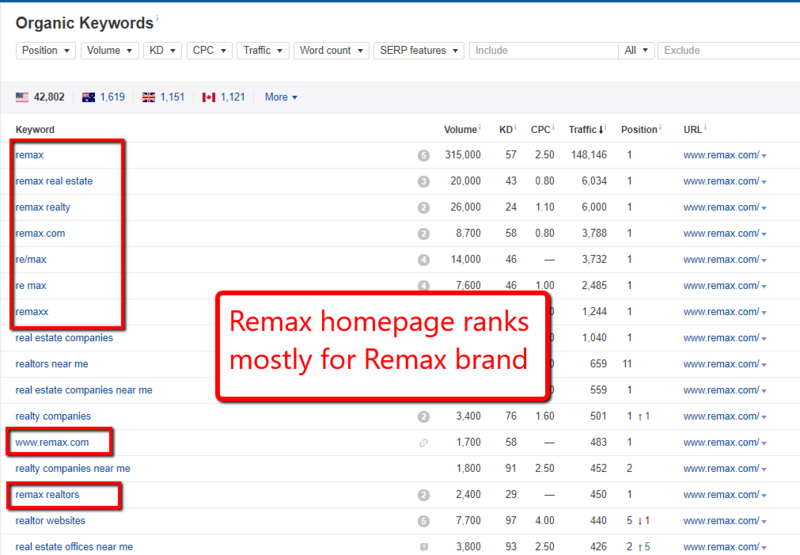 However, if you click to view the "organic keywords" their homepage is actually ranking for, we see it is mostly ranking for its brand, "Remax," and variations on its brand. 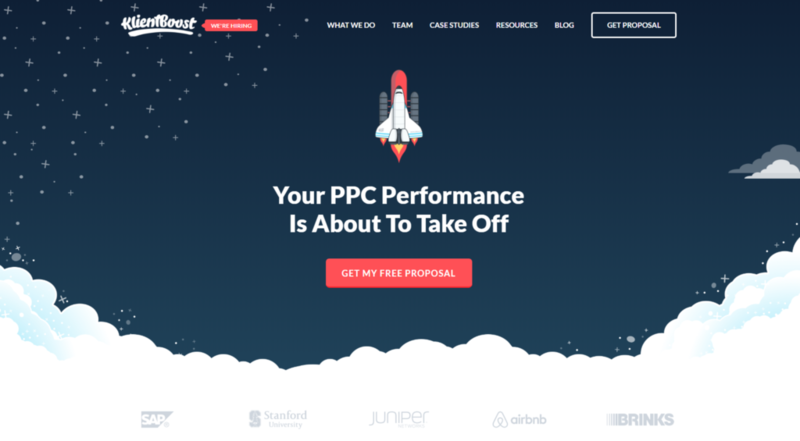 This is a great page to "StoryBrand" since they don't have much going on SEO-wise on their homepage anyway. It is highly unlikely making even sweeping, large scale changes to the homepage will change its ability to rank for its own brand name. Note: If you're creating a new "Storybranded" home page or sales page, you'll also want to be sure to include keywords in the SEO locations above. Generally speaking, if you're already ranking for some keywords, and your page includes those keywords in the SEO elements listed above, you want to keep them in a redesign. Let's take a look at the title tag, description, and H1 on the Remax homepage, as an example. Meta Description: Trust RE/MAX and our team of real estate agents to help you find homes for sale or to sell your current home. See the newest real estate listings at RE/MAX. What we find in these 3 key SEO areas is that Remax does include its own brand name in the title and description (so we want to keep that in any redesign), but they don't optimize much for other words they are ranking for like "real estate companies," "realty companies," or "realtor websites." In other words, there's probably nothing they're doing "on-page" to help them rank for all their non-branded keywords. My guess is they're ranking highly for these words because they are a massive, authoritative brand with thousands of backlinks, as well as other content on their site. Again this reinforces my belief that you could probably redesign this entire page with little-to-no SEO impact. Now let's say you have a sales page or home page that's ranking for quite a few various keywords. 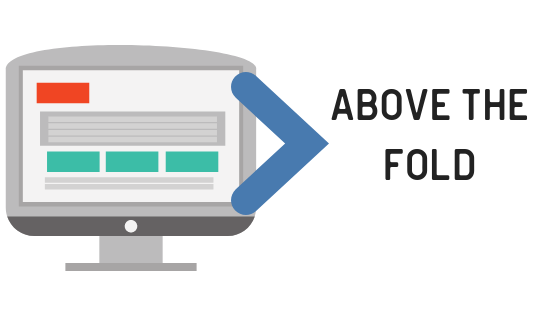 Also keep in mind any changes to a page could bring about a temporary decrease in traffic (sometimes, not always), but the page may come roaring back after a month or two. H1, H2, and H3's - Yes, you can change/improve them but keep your ranking keywords. Say you're ranking for "auto repair" and have a terrible H1 like "We do auto repair work." You want to keep "auto repair," which you could do by changing it to something like, "Say goodbye to auto repair headaches." Navigation Menu - Yes, you can change it, and most nav menus need to be reduced, but watch out for removing navigation links to other pages on your site that are ranking. Paragraph Text - Text is often one of the things we want to delete after going through StoryBrand. If you can keep some or all of your text, especially if it contains keywords you're ranking for, that would be best. You might try hiding some of the text under a "click to see more" button so Google's bots can still see it, but your visitors can't. 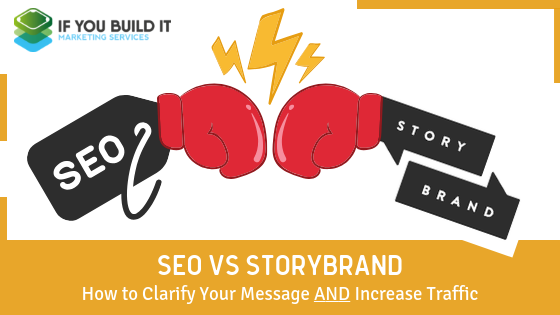 Bottom Line: Keep these key SEO elements in mind, and you will usually be safe making StoryBrand changes to ANY page on your site with little impact on your rankings. The strategy for designing a new page that follows StoryBrand guidelines AND that will do well in SEO is to follow the same guidelines I detailed in the page redesign section above. 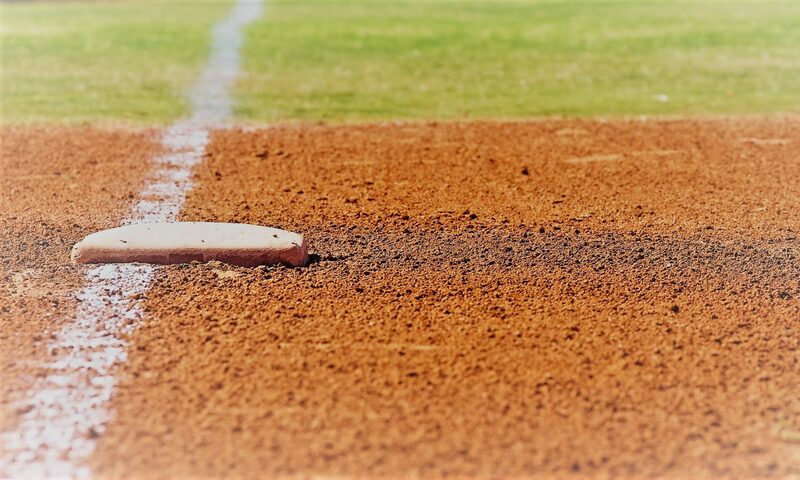 Even if your page doesn't have a lot of content in it, you need to be sure all these elements are used to give you the best chance at ranking. Ultimately, though, other factors go into ranking your page besides "on page SEO", such as backlinks to the page and overall authority of your site, so don't sweat it too much. The bottom line is you should feel safe creating any new page or redesigning most pages to follow StoryBrand principles, if you follow the guidelines above.